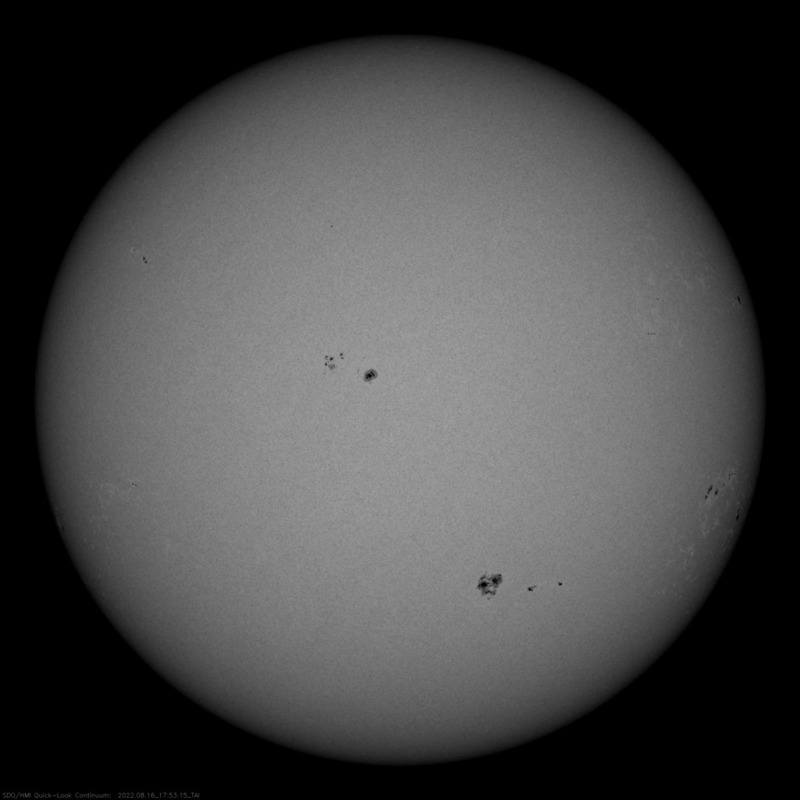 Since a few days a conspicious sunspot group, AR 1108, is rotating onto the disk, as can be followed best via near-live white-light images from SDO's HMI instrument but also amateur equipment as here on Sep. 19 (more), Sep. 18 (more) and Sep. 17. Earlier there were spectacular eruptions on Sep. 15 (timesteps one and two) and on Sep. 8 (movie, more, more, later, coverage here and hier, plus the group responsible earlier on the disk). • There is some indication that sunspots are losing contrast over time (covered also here and here), more on the state of the cycle, the continued lack of an effect on climate - and a preview of the deep partial eclipse next January. 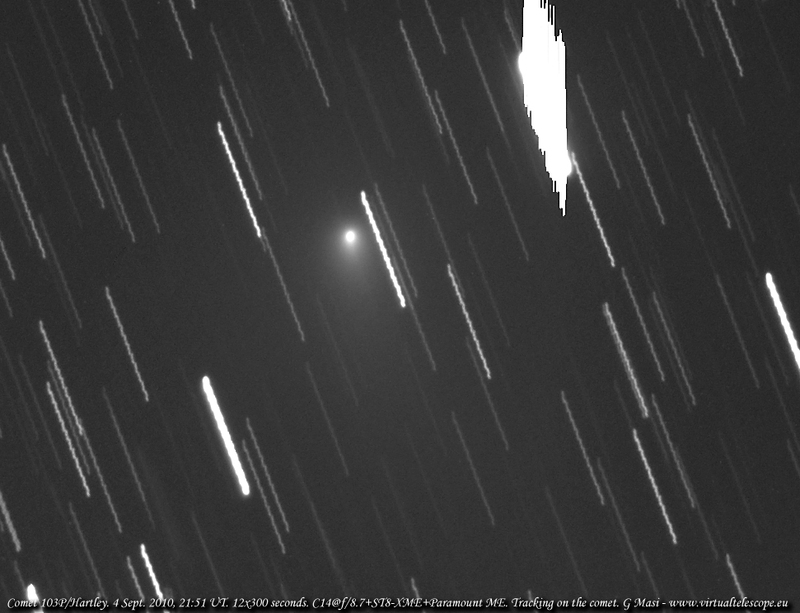 • Meanwhile Epsilon Aurigae in still in deep eclipse near the middle of the long event. The closest approach of Jupiter since 1963 is making news here, here, here, here and here; some pictures of Sep. 7/8, Sep. 4 (more) and Aug. 25 (infrared); Uranus is very close to it as seen in images of Sep. 17, Sep. 5 and Aug. 28; also Uranus' moons on Sep. 6. • Jupiter is an excellent target for amateur science, esp. 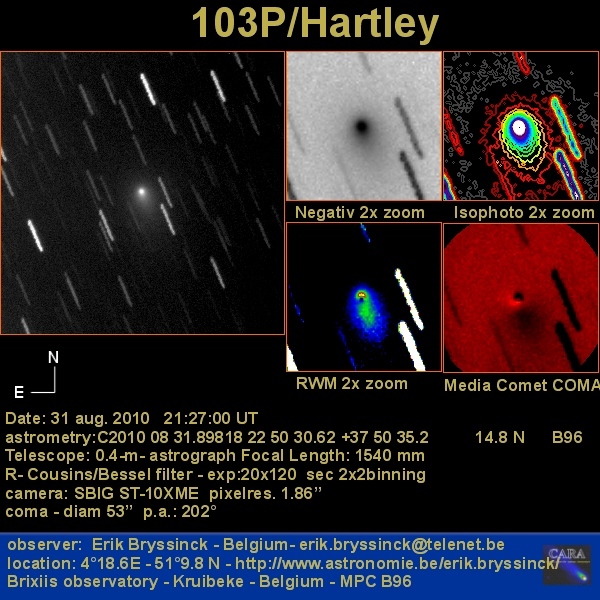 impact monitoring: There are new papers on the June 2010 flash [alt.] and the 2009 aftermath, discussed by ESO, NASA, JPL, NASA HQ, Gemini and Sandia Releases, Science@NASA and stories here, here, here and hier. • There was a Venus occultation by the Moon on Sep. 11 in Southern Africa, also seen here and here; in Spain, Germany (more), India and Australia (earlier) there was only a conjunction. Also Venus, Mars and the Moon in dark skies on Sep. 11 and Sep. 10. 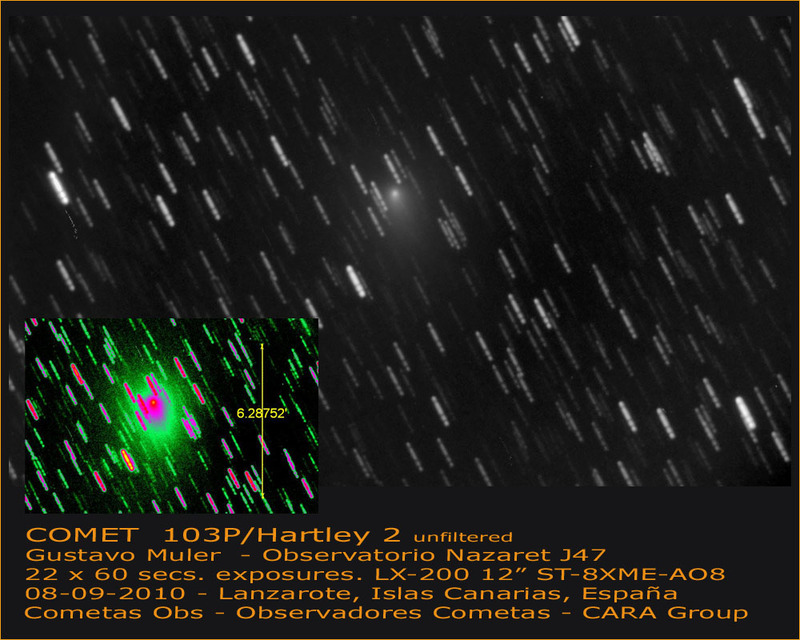 The race is on between Deep Impact and amateurs worldwide to capture the best views of comet 103P/Hartley (2) as the approaching spacecraft from the EPOXI mission is now sending images as well: a blog, the status, the pictures, the 2nd one, the 1st one and discussion here, here, here and here. 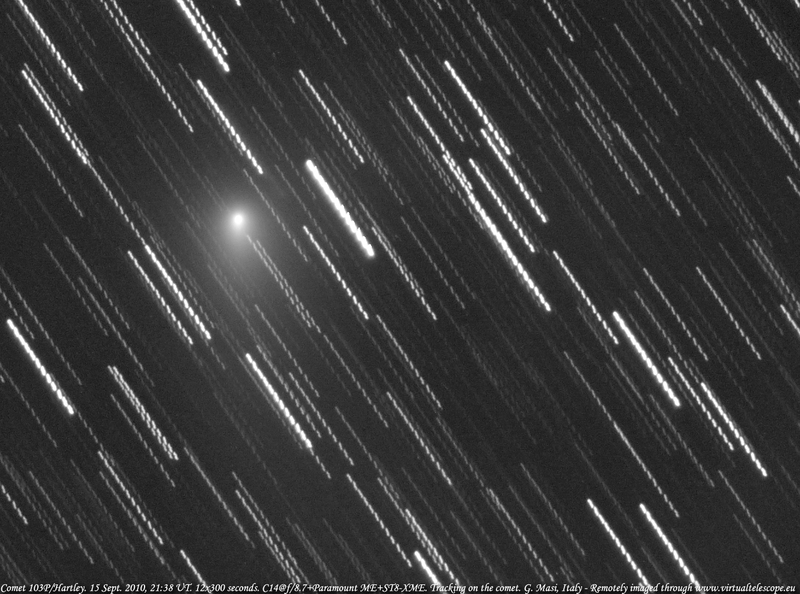 Some general info on the brightening comet here, here, here and hier, some images, also from Lowell Obs., and selected amateur shots of Sep. 19 (more), Sep. 18 (more), Sep. 17, Sep. 16, Sep. 15, Sep. 11-13, Sep. 13, Sep. 12 (more), Sep. 11 (more, more and an animation), Sep. 8, Sep. 7, Sep. 6 (more, more), Sep. 5 (more, more, more) and Sep. 4 (more, more). 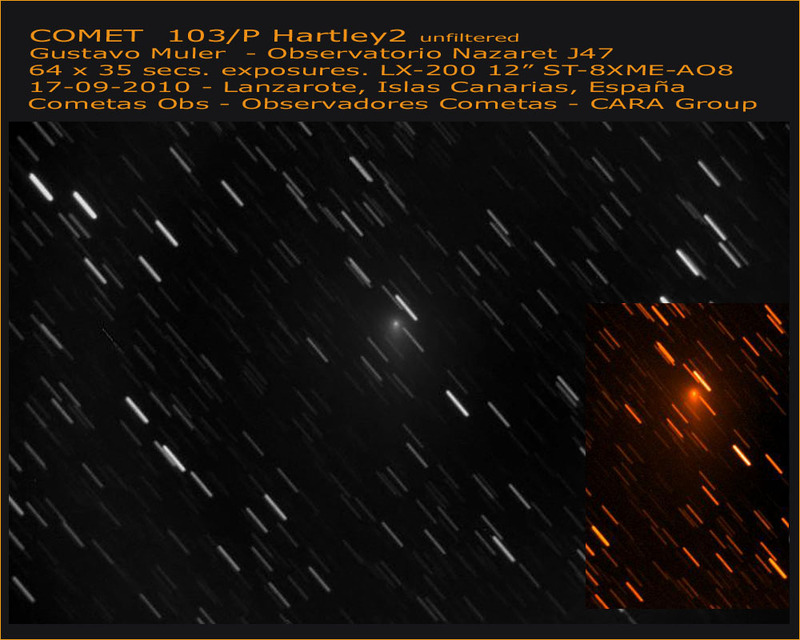 • Even more interesting, though, is 10P/Tempel as seen on Sep. 16 (also Sep. 17 and Sep. 18 [more]), 236P/LINEAR has a little tail, and there is yet another La Sagra comet discovery, seen here on Sep. 18. 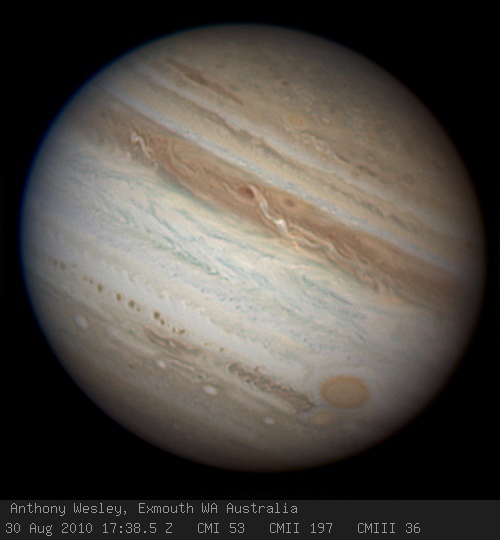 The events of June 3 have repeated on August 20, and again in the Far East: This time it were three Japanese amateur astronomers who recorded a brief flash above Jupiter's clouds from three different sites. And again no traces whatsoever are left on the planet - another airburst then, and one wonders how frequent these really are. The three reports (and pictures and videos) are collected here and here, the first video is here (YouTube version), and the 2nd observer reports here. Coverage in the mainstream media seems to be scarce, with samples from the UK, Japan and Russia; it was again bloggers who ruled the day. Like Gish Bar Times (earlier), Sky & Tel. (updated repeatedly) and the Planetary Society (earlier), also this, this, this, this, this, this, this, this, this and this story, plus SpaceWeather (earlier). Even without traces of the impact Jupiter is very interesting right now: selected images of Jupiter from Sep. 2, Sep. 1 (more), Aug. 30 (extremely good; from this collection, also here and here), Aug. 22 (more, more), Aug. 21 (more, more) and Aug. 20; also 3 moons resolved. • A trio of Venus, Mars & Spica has turned into a line now, as images from Sep. 2, Sep. 1, Aug. 31, Aug. 29 (Austria vs. Australia) and Aug. 24 show. • Resolved amateur images of Uranus. 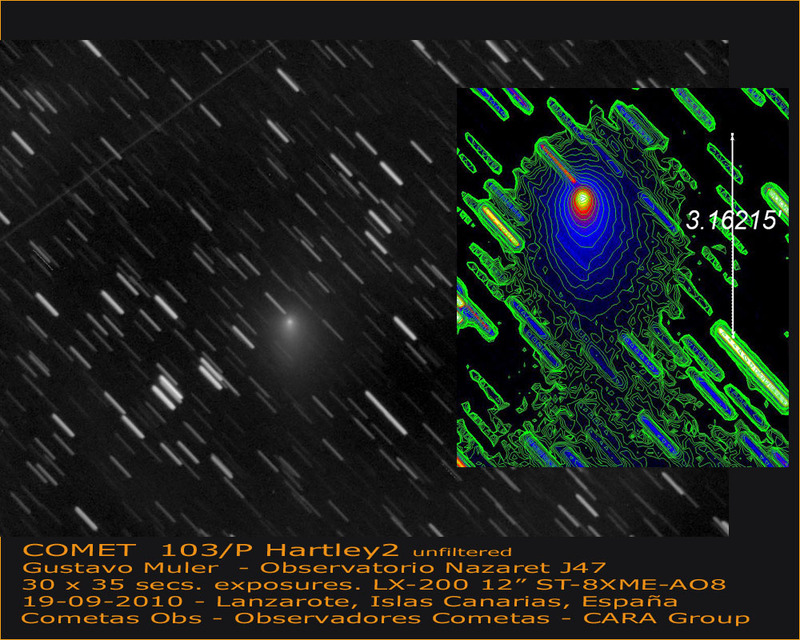 • A gallery of images of comet 103P/Hartley 2 and a blog from the EPOXI mission that will meet it 2 months from now. The brightness still ain't great; some images of Sep. 2, Sep. 1, Aug. 31 (more), Aug. 30, Aug. 29, Aug. 27, Aug. 22, Aug. 20 (more) and Aug. 19. 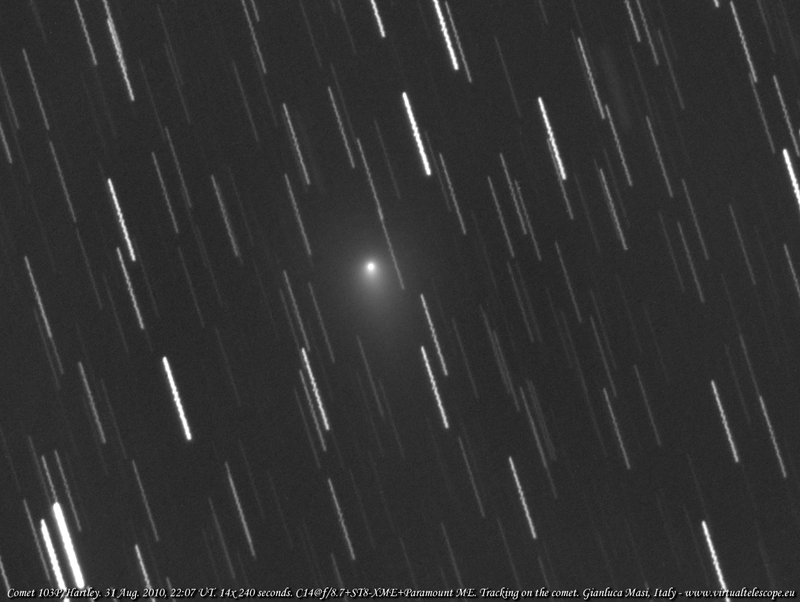 • Also 2P/Encke on Aug. 22 (explanation) and in STEREO's FOV; it was closest to Earth now. 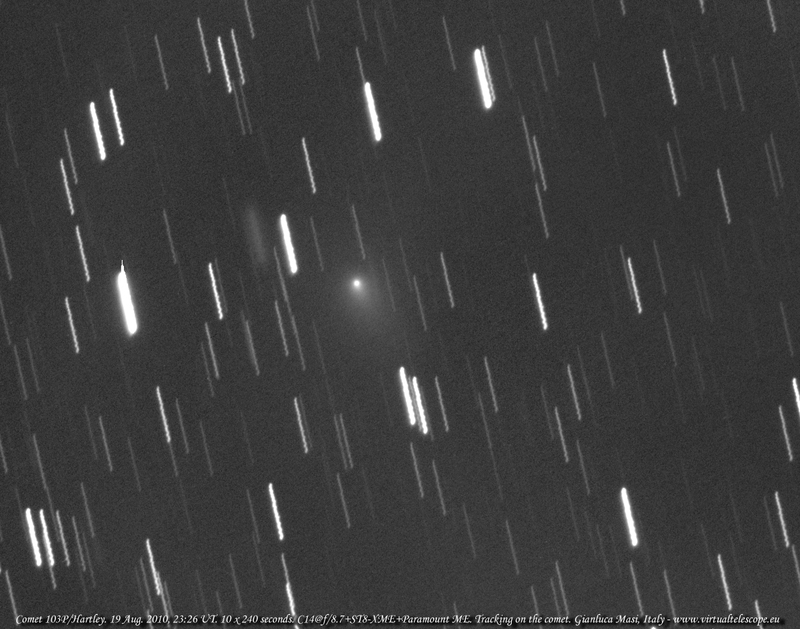 Plus C/2010 G2 (Hill) in outburst, yet another twist in the P/2010 A2 saga - and 30 years of asteroid discoveries visualized. • A sporadic meteor goes bang, and one megacryometeor case finds a likely solution in Germany. In other news yet more interesting visuals from the July total eclipse: hi-res pics from Tatakoto (also a video from there), several reports from Polynesian islands and film vs. digital images from Rapa Nui. From Patagonia an image collection, featuring a Finnish observer (eclipse report, horizon analysis, source) and yours truly who also stitched TSE panoramas from 2008 from one pair of wide-angle images and another one. • Talking about the Sun, hi-res images from Big Bear (more, more and more), a new SDO video front, 10 years of Cluster (more), the physics and a visualization of the solar B field, a July prominence sequence, solar mosaics, SID data showing increasing activity (which can influence navigation, the upper atmosphere [mehr] and more - or maybe not). There is also speculation that the Sun's action influences the length of the day - and radioactive decay, but this widely reported story is almost certainly wrong. • For the record: the aurora shown here was actually imaged on July 25th already, but the date generator on the ISS was wrong. And you can make your own aurora, too. 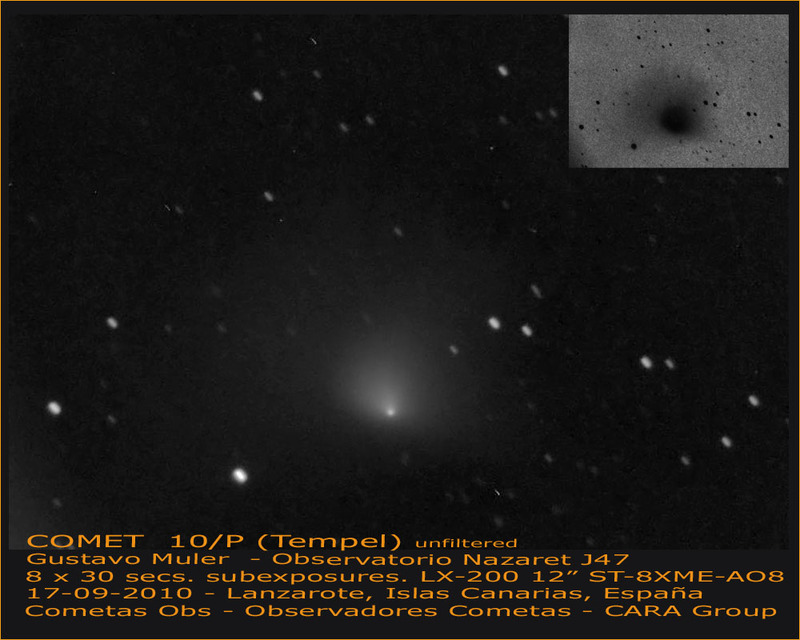 • Turning to other stars now, CoRoT has seen asteroseismological evidence for an activity cycle just like the Sun's, only much faster in another star. 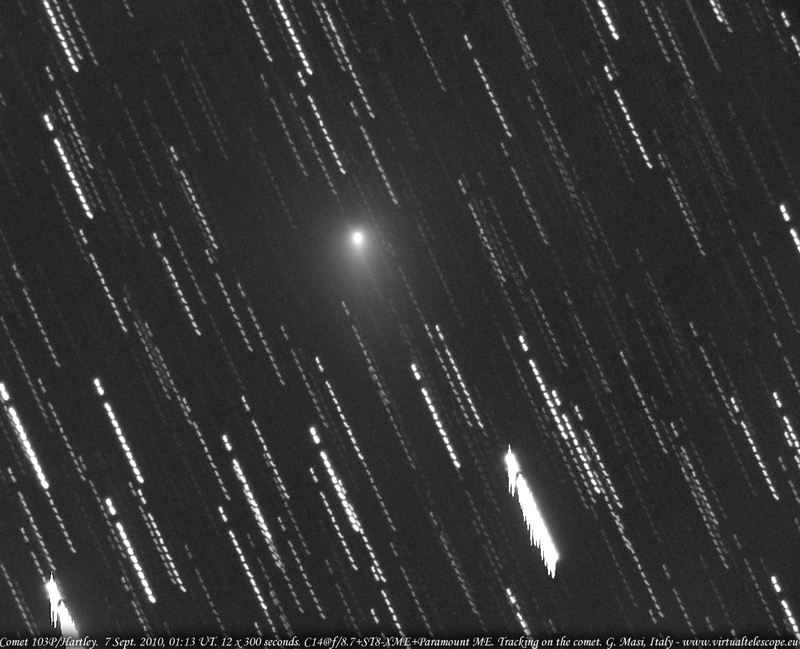 • Epsilon Aurigae has been observed again with CHARA, but the interferometric images won't be seen anytime soon. Also a V-band light curve. • Tom Boles has, in rapid succession found his supernovae # 133 + 134 and 135. • It's now one year after the fire that threatened Mt. Wilson. 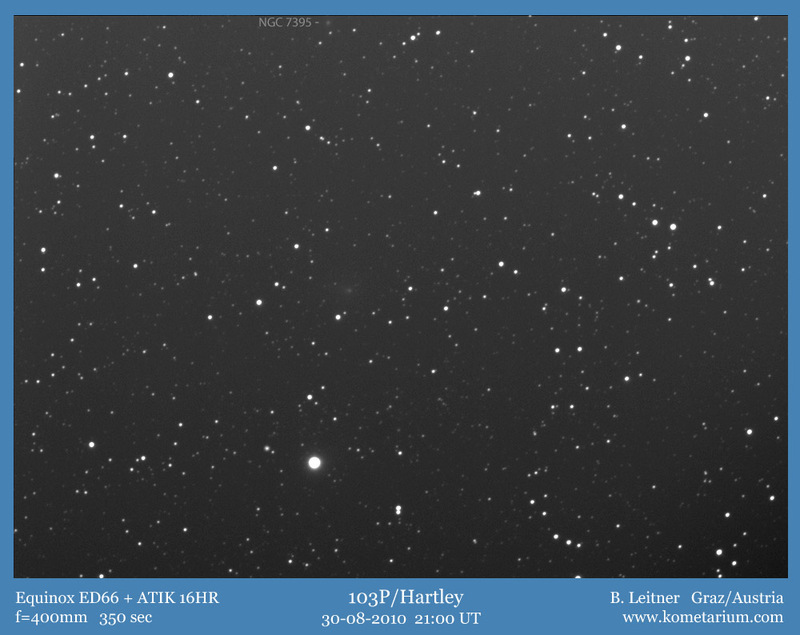 • A video report from a star party in the UK. • The Milky Way over Bryce Canyon. • And an old sun dog image has been sold to the BBC - as a daylight fireball! The beeb has killed the respective website, but here it is, from Google's cache ... • Finally a brief preview of September 2010 (more, more, mehr und mehr): There'll be a good Mercury morning visibility for the N. hemisphere, Sep. 18 has been declared as Observe the Moon Night - and on Sep. 21 we have, simultaneously, Uranus and Jupiter in Opposition, the latter coming closest since 1963.